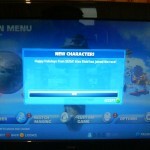 Yes, the unlockable Christmas gift is SEGA’s classic old mascot Alex Kidd. 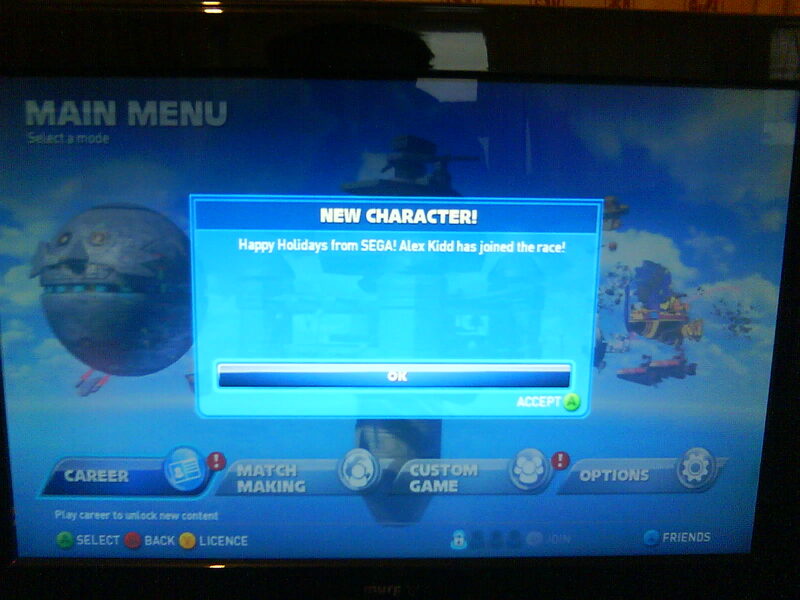 As pointed out earlier, you can play as him on Xbox 360 to your hearts content when your console isn’t connected to Xbox Live, but as soon as you connect, even when signed out, Alex Kidd will no longer be selectable until you disconnect and repeat the trick. 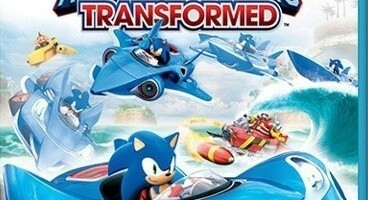 Next Post > Next post: Sonic & All-Stars Racing Transformed 3DS Delayed Again to Jan/Feb? Haven’t tried, but I’d imagine he’s still unlocked after that date, too. 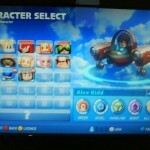 Just tried January 1st 2013 and Alex Kidd was still unlocked, but nothing different unlocked for New Year’s Day, though. Tested on PS3, works there too. Alex Kidd only appears while you’re disconnected from Xbox Live, though, otherwise Xbox Live automatically sets the console to the correct date. I take it this works on the Wii U as well? I’d assume so, but if anyone can confirm it, we’d love to hear from them. Quick!!! Check all the holidays!!!!! I never got why Alex Kidd became the mascot for a while in the first place. His game wasn’t really that good. Granted I played 5 mins of it before I got completely and utterly confused. As a big AK fan who’s still waiting for the PC version to come out, this worries me a bit. Will it be released before that date? And if it doesn’t, will Alex Kidd get unlocked anyway? Either way I hope he’s not left out of the PC version entirely, I’d hate to miss out on my favorite character from the previous game just because I don’t have the desire to buy a console (mainly because they’re ridiculously overpriced in my country, games included). Oops, I meant to make a standalone reply. In any case, was that game you talk about Miracle World? Because I think that’s a pretty straightforward game… If it was High Tech World, however, I’d understand where you’re coming from immediately. reminds me of Simpsons road rage when you set your clock to a holiday you get a themed car like Halloween you get Halloween bart etc, I wonder if there is anymore characters hidden in Sonic transformed? easter for Billy ? Someone get on Easter now! Well I’m getting this game for Christmas anyways, what a surprise this’ll be when I boot up the game, oh next try valentines day, saint patricks day, easter, and July 4…oh wait Sumo is European, ok try all the other European holidays. They should have made NiGHTS the character you unlock on Christmas Day. That would make so much more sense, with Christmas NiGHTS and all. In that case they could just make Reala unlockable by setting the date to April 1st, if you want to make Christmas NiGHTS parallels. I know Alex Kidd was the old mascot for SEGA, but I never really got attached to him (mostly because I wasn’t around then XD). 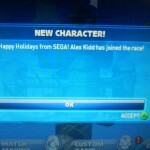 He’s cool though, and thank you SEGA, I appreciate this little Christmas gift. Oh man, this news makes me so relieved — I was afraid he wasn’t gonna be in there at all (I saw the hacked-in YouTube vid, but seeing as he isn’t among the usual unlockable characters, I had feared he was either dummied-out or left in for future DLC). So glad! With this new information coming to light, I’d like to think that, after ALL the hate people were showing for Alex’s absence, that S0l is somewhere, sipping a coffee, and sighing smugly. Sir, you just won the net for that last comment. Was this was discovered by chance or do people go round changing their Xbox clock whenever they get a new game? Our tipster didn’t say, he just told us the news. BY THE POWER OF BOREDOM! Should’ve been someone worthwhile, like Nack The Weasel due to that sonic character poll from Steve Lycett. Wait, if sumo’s european… someone check the 24th! Sonic 2 came out november 24th 1992 in Europe, so maybe Super Sonic’s unlockable! This could be stupid, but it could work! this reminds me of how gurumin changes themes and gives you a costume when a specific holiday comes up except it will only last for that day. Ever since Superstars Tennis and those hard matches against him I’ve hated alex kidd. Don’t use him in SASASR, no way I was going to buy dlc for him. But I’m not so sure if its for the people in UK too. Darn and here is was expecting NiGHTS in a Christmas costume, but I can live with Alex Kidd. WTF Danica Patrick isn’t a default racer and Ralph (Wreck-it Ralph) is!? they should both be defaults. Hmmm, Opa Opa, Zobio and Zobiko and Jacky and Akira aren’t in a petition so does that mean they might be on separate holidays? I wonder if it works if you get the game /after/ Christmas. Will it already be unlocked then? No. It reads the system calendar and then if it reads Decmber 25th it unlocks it. Something along those lines i believe. Hmm, so basically switch it back to December 25th to get it. Gotcha. Alex Kidd automatically unlocks any date after December 25th and stays unlocked. He only locks up again if the date on the system is before December 25th. 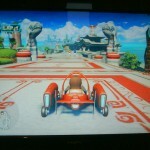 Will Alex Kidd be unlocked if the 3DS version is delayed? Or will we be getting him as normal. because if the 3DS version is delayed, then the Christmas unlockable for the game, would not work. I need answers on this please.